This is for the whole enchilada and one step closer to a Perfect Season in the VFTG history, folks. And this is the nearly worst The Voice of America finale in years. If Christina Grimmie wins The Voice of America tomorrow, we will be adding Jessica Meuse from American Idol 13 and Ellona Santiago from The X Factror 3 among non-winners in the VFTG Hall of Fame. Nothing can possibly be historic. So tonight, you need to stop what you’re doing and vote for the entire 14 hours. Get everyone you know to vote. And we’re providing you with some tips on how to vote the most effective way to give us the best shot at a VFTG Victory. ● If you have mobile (Sprint), you should be texting 1 to 8642 10 times. This is much faster than calling. ● If you don’t have Sprint mobile, you can dial 1-855-864-2301. ● You also get 10 votes on NBC.com/thevoice and via Facebook, but these votes will be counted after your 2 hour window closes. So vote on Facebook later in the night once you’re done texting and calling. You only get 10 votes, so stop after 10. Calling and texting is also limited to 10 votes per voting methiod. If you live outside the US, just change your location to be from the US for a few hours and you can vote. 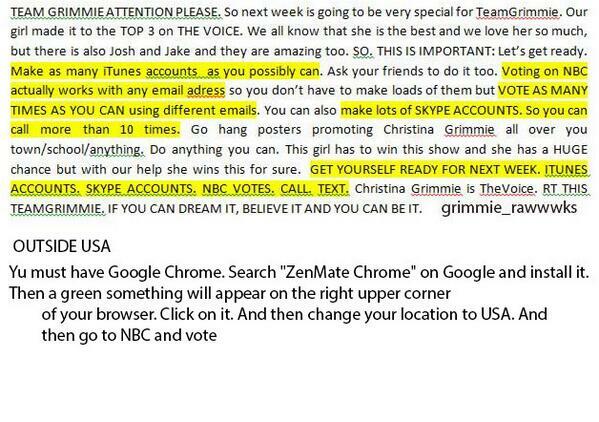 ● You can also her performances on iTunes.com/thevoice but these downloads will count as votes will be counted. So vote on iTunes later in the night once you’re done texting and calling. You only get 1 votes, so stop after 1. If you live outside the US, just change your location to be from the US for a few hours and you can vote. ● If you live on the East coast or outside the US, you can also vote during the West coast time zone (10 PM -12 AM PST) if you have an account through Skype. You can also download the Skype app on your smartphone and vote that way. This is how International fans are voting. TheVoice of America is too stupid to track where votes come from, their system is not that intelligent. International VFTGers can also use MagicJack, NetTalk, and Vonage to vote if you have any of those at home. By the way, since it was mentioned on iTunes, Jake and Josh are really boring.